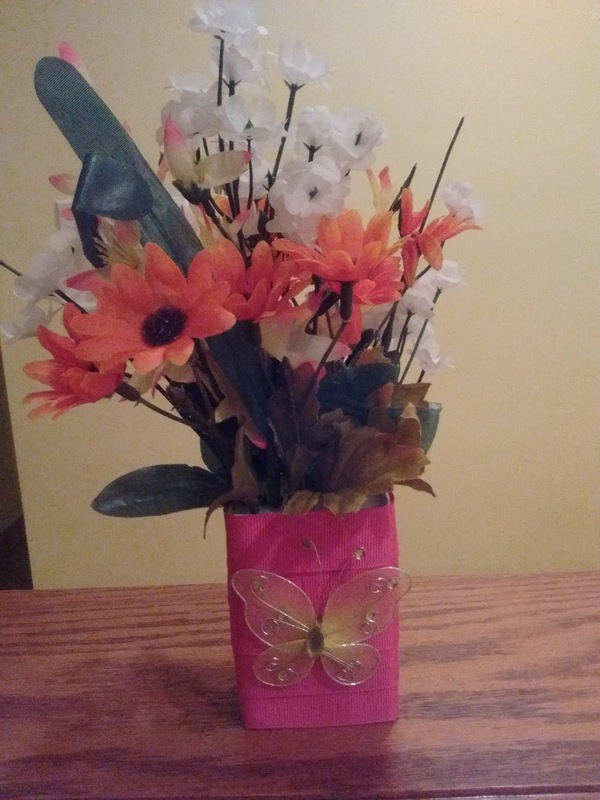 Inspired by Tracy at You Tube's Gift Basket Appeal Channel, my 7 year old created this sweet table top bouquet using a soap box, ribbon, styrofoam packing, dollar store flowers and a butterfly embellishment. Oh, and a few rocks to keep the box from falling over! My daughter did all the work except the hot glue. We took a Yardley soap box and covered it with pink ribbon, hot glued on. Then we added a few stones to the bottom of the box just to keep it from tipping over. We had some styrofoam from a package that my daughter cut down to just the size of the box. I glued that into the box. I used wire cutters and flowers from the Dollar Tree to cut floral stems that my daughter placed into the styrofoam. The piece-de-resistance was the Dollar Store butterfly I hot glued onto the front of the base. Thank you, Tracy ( I hope I spelled your name right). If you want to see her full tutorial, visit https://youtu.be/LBrjhLT8pEU.